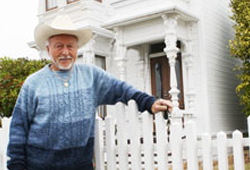 Instead of writing a check, Jerry decided to give an asset: his beautiful home in Eureka. Jerry understood that his gift would help the hospital now and into the future. His gift is called a retained life estate, a planned gift in which a donor can transfer ownership of a house to the hospital and receive a significant tax deduction, but live in the house until his or her death. Supporting St. Joseph Hospital's capital campaign with a retained life estate gift was the right choice for Jerry. And there are many other ways to support the hospital, including charitable gift annuities, wills and bequests, and charitable remainder trusts. Each way of giving has advantages, including significant tax savings and deductions. To learn more about giving options through the St. Joseph Hospital Foundation, call Paul McGinty at (707) 269-4200.